Every year, around this time people start loosing their minds. Apparently there is no happy situation to be in; if you are single you are frantically looking for a date and if you happen to be in a relationship, the pressure to do something special is probably giving you a severe case of indigestion. If you are anything like me, you probably were waiting for the eleventh hour for some inspiration to strike, by which time all the good old options of a nice dinner is already out of the window unless you are famous enough to have a standing reservation at a fancy restaurant or your date is crazy about Mc Donald’s happy meal. 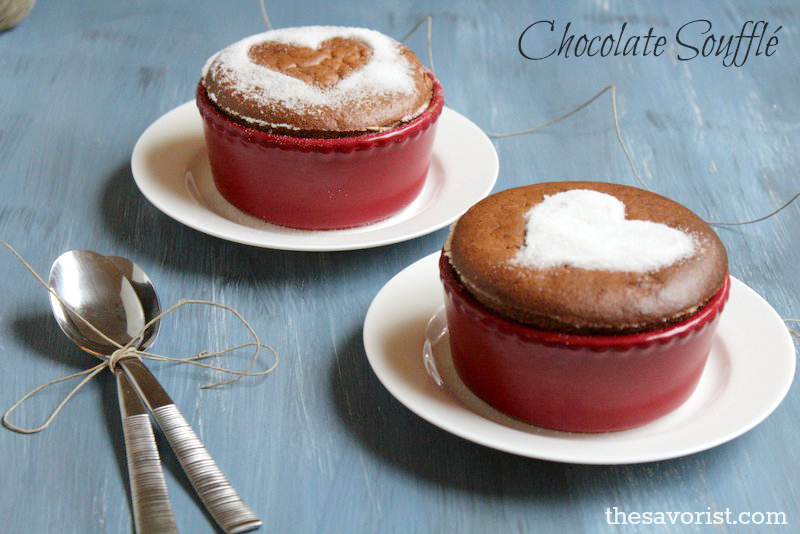 Without any further ado, I present you mindblowingly simple, extremely impressive, decadent, sinful, orgasmic Chocolate Souffle recipe for two. A dessert, perfect for special occasions. Now you’ll need to melt the dark chocolate. To melt the chocolate, boil water in a pan, put another glass bowl on top to create a double boiler (this is to make sure that the chocolate doesn’t come into the direct contact with heat source and gets burnt). Add the chopped pieces of chocolate and 1 1/2 tablespoon of butter to the glass bowl, mix them to make sure there are no solid chocolate pieces left. Once the chocolate is melted, slowly add the molten hot chocolate to the egg yolk mixture while slightly whisking the mixture. Make sure to lick your fingers/spatula clean. Coat the baking dishes (ramekins, stoneware or any other oven safe dish you are planning on using) generously with softened butter. Brush the butter vertically around the sides of the bowl, as well on the edges, so that the soufflé will rise along the lines. Then Coat the pan with nicely with granulated or powdered sugar. Keep aside. Take a large bowl, whisk the 2 egg whites, until they start foaming. Slowly add a pinch of salt and 1 1/2 tablespoons of sugar while you continue to whisk. Don’t add all the sugar at once. Add a little, whisk for sometime and add some more, whisk again. This may take a while and I recommend using an electric hand mixer for this. The egg whites need to form white stiff foam peaks, so if you turn the bowl over your head, nothing falls down. They should be opaque white-glossy and hold a shape but don’t over whisk as that can cause them to break down. At this point drop everything, grab your phone and take a picture of the egg whites bowl turned over your head and instagram it. Gently fold the chocolate-eggyolk mixture into the foamy egg white mixture. Don’t be aggressive while mixing as it will cause the eggwhites to lose all the air that has been whisked in to make it foamy and make the soufflé soft and spongy. Gently spoon the soufflé into the butter-sugar coated bowls to the brim. 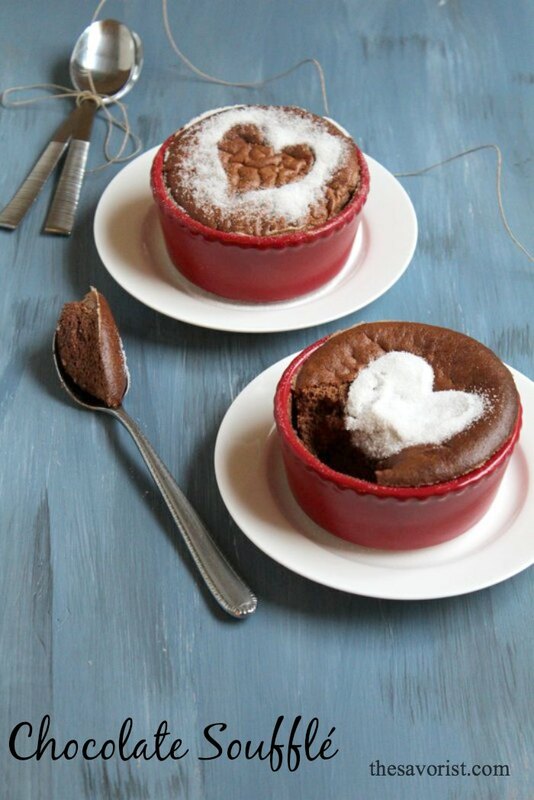 This is to make sure that when we bake it the soufflé rises above the bowl. At this point you can cover the bowls with cling wrap and refrigerate it for up to 1-1.5 hours, if you plan to have it post dinner since it takes only 15 minutes to bake in a pre-heated oven. Otherwise you can proceed – put the bowls in preheated oven. 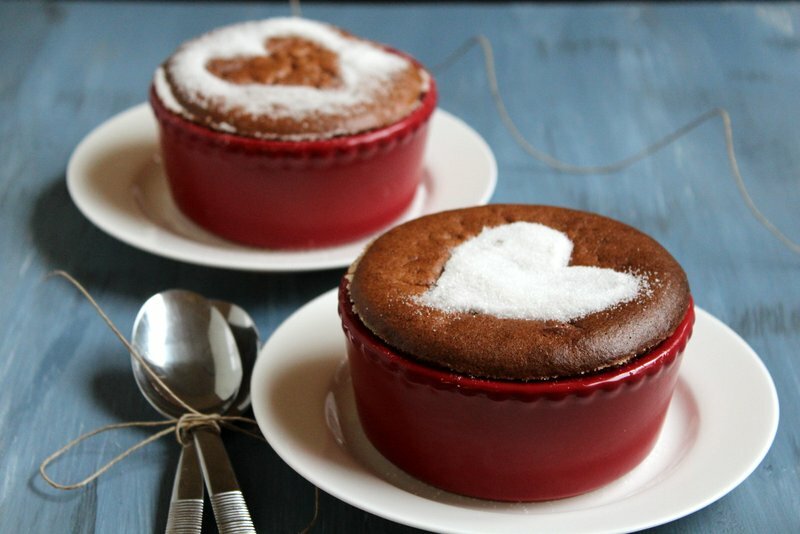 Bake the soufflé anywhere from 15 minutes-20 minutes, depending on the size of the baking dish. Souffle is ready once it has risen and the top is set. Dust it with confectioners sugar, take a picture or two if you must, and serve immediately, with vanilla ice cream or whipped cream or as is. If you wait for too long like I did and spend too much time taking pictures, you’ll end up with slightly deflated souffles by the time you get around to eating them. Oh wow, these look divine!! They are beautiful! I have ramekins in the china cabinet that never get used; I feel inspired. Thanks you, I hope you get to try them. The lack of like button is by design. I consider them conversation killers.